I realize that this blog has been the No on Prop 8 Channel lately, but the issue really is this significant. This is not simply some text on a ballot. This is not a time to say, "Sorry it didn't pass." To do so trivializes this monumentally important cause and, frankly, is incredibly offensive. Your choice affected people's lives. Your inking "yes" took away rights from an entire group of people. And, if you don't understand this, you make me really sad. But my arms remain open to you because I'd rather try to educate you than have you remain staunch about your vote. This entry isn't going to be about Prop 8, but I do want to say that my friends are awesome, and you should read what they have to say. Of note is Sable Crow's most recent tale about protesting and actually changing the mind of one individual with whom he had an impromptu hour-long conversation. If this story doesn't make you want to add him to your Google Reader, I don't know what will. This entry may be even more eye-opening than the one I linked yesterday. I also encourage you to read Glam's take on what it means to vote no on Prop 8 while still being devout. You can believe in God and still be against Prop 8. The two are not mutually exclusive, and hiding behind the shroud of religion is cowardly. And that is my Repeal Prop 8 spiel of the day. 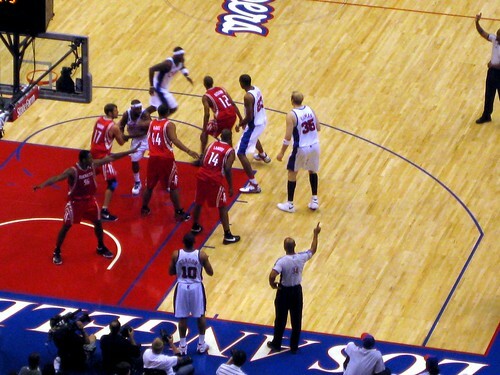 Last night, we went to watch the Clippers with our friends, Mr. and Mrs. Nittany. Can you say nosebleed? Yeah! 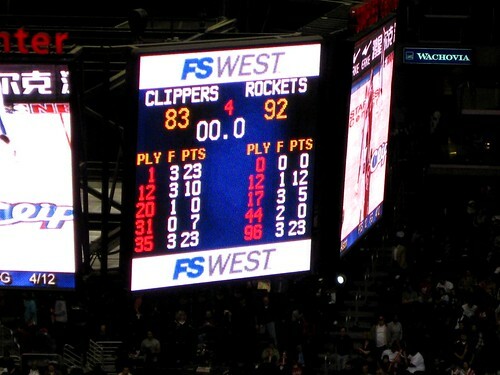 At least the opponents were the Houston Rockets. 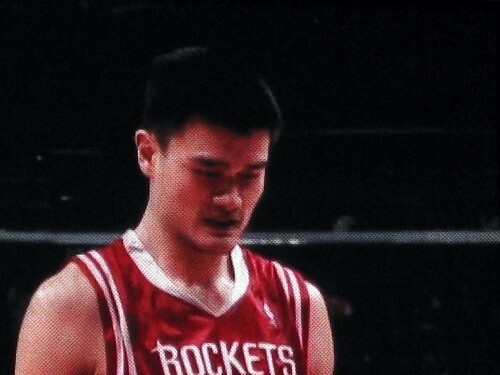 I was excited to see Yao Ming. He is really something. Tons of Chinese people came out to see Yao. 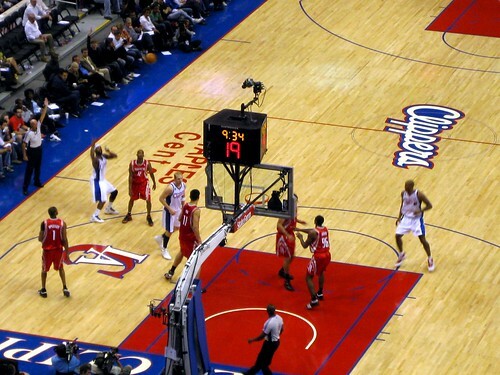 The Clippers use really weird graphics. 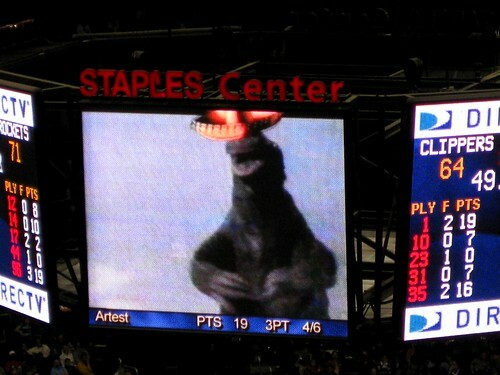 This Godzilla with a sombrero accompanied the "DEFENSE" chant. 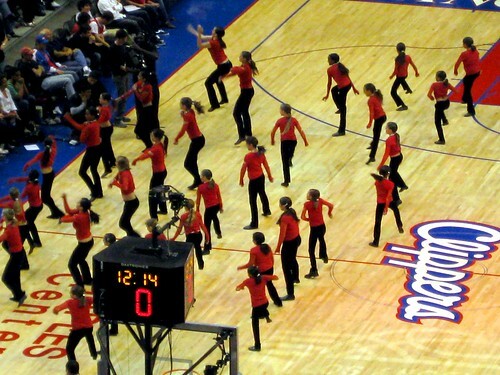 I was more impressed by these little girls at halftime than I was by the Laker girl rejects Clipper Spirit. As usual, I had a caramel apple with nuts. 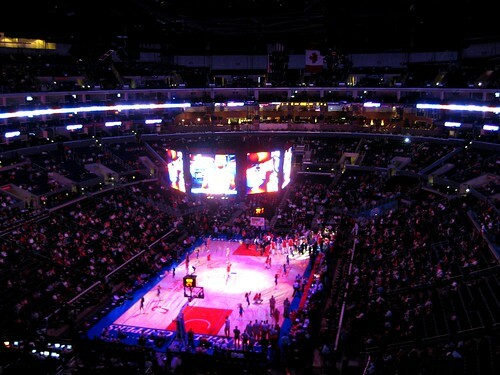 Best thing at the Staples Center. 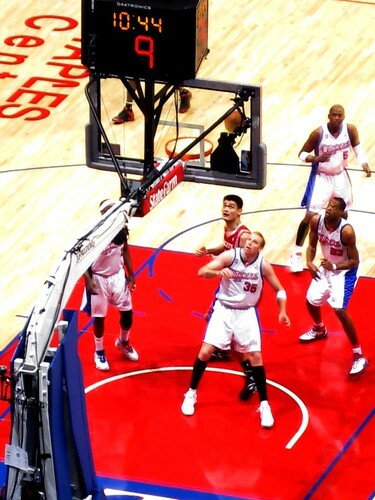 The Clippers lost their sixth game in a row. Funny how one L.A. team is so good, and the other is...not. i created a random faith rant, as well. 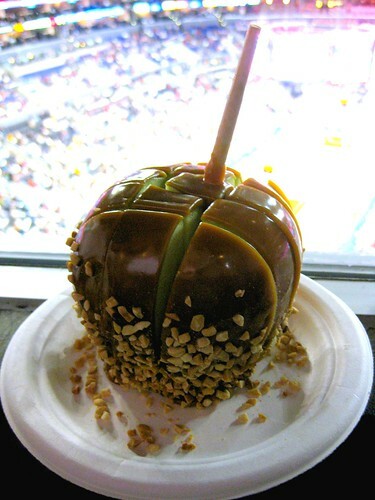 yummy...nutty, caramel apple...that's reason enough to visit Staples Center! I appreciate your continued commitment to Prop 8. I'm right there with you on that. Thanks also for the links. Wonderful, wonderful stuff. I love your Repeal Prop 8 comments. We had a constitutional amendment here in FL that even bans "substantial equivalents" to marriage - and it required 60% to pass - and it passed. I was so disappointed, but looking to my former state of CA for some good news on this topic (I donated to No on 8 even though I don't live there anymore). I couldn't believe what happened there. It has really been a huge dark cloud hanging over this otherwise happy election week. sable crow's lastest post was chill-worthy. yay for basketball fun. we had our first lakers game wednesday night and it was awesome. nice for the season to have commenced already. Great post on Prop 8.. all the way across the country and shaking my head. Wishing there was something I can do. Your continued commitment to the cause is really important. Obviously, more voices like yours need to be heard, and this isn't an issue that should just disappear into the ether! I wish I could have voted on this. your nosebleed seats reminded me of when hubs and i went to the celtics game and had similar seats.. and i said "wow, i feel just like jayz and beyonce.... just 80 rows from courtside!" bball games are always fun! I appreciate you writing what I want to say. I just visited Sable Crow's site for the first time. He truly is amazing. Thank god for you. I don't believe in god, but you know what I mean. Caramel apples make almost everything better--not tyranny of the majority--but most other things. I think talking about it makes it real to some people who never considered the real effect it has.